Mercedes 300 SL Cabrio | Flickr - Photo Sharing! 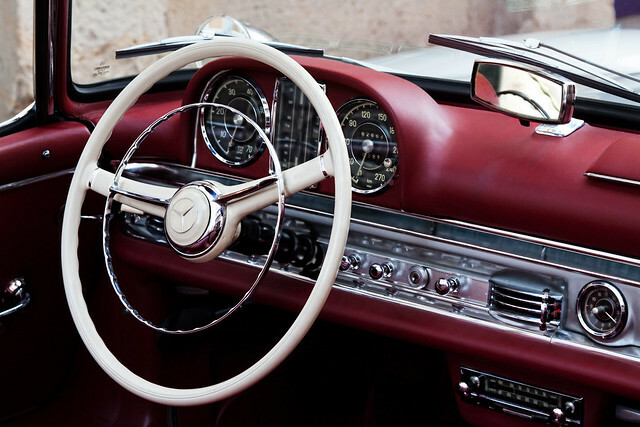 Cockpit of a absolutely well-kept Mercedes 300 SL (W198) Cabrio from 1959 in Osnabrück, Germany. Thanks a lot to the patient and friendly owner, who was in hurry but let me finish my captures! i_still_believe_in_u, and 10 other people added this photo to their favorites. fabulous details and colour, quite the classic! Hi, I'm an admin for a group called ★★★Shutter Bug★★★, and we'd love to have this added to the group! Your photo has been selected as we like your style & think you might be able to contribute your shot to our group. We would also like it if you joined our group which is all about sharing tips, tricks & techniques with other photographers from all over the world. Please have a look at our numerous different posts with lots of information for different levels of photography, feel free to browse or add your own, & join us! Then go here to tell us where you are looking at us from! Welcome to Shutter Bug, where are you from? Or drop a post card shot of where you are from! A postcard of where you are from! Enjoy & thanks from the Shutter Bug group. simply beautiful ...great shot my friend! Ein schöner Blick in ein schönes Fahrzeug!